Even the mysterious world of Harmony has people who don't quite fit in. They're drawn to places like Rainshadow Island, a beautiful sanctuary where anyone can feel safe—and where secrets are closely guarded. Schooled in an exotic form of martial arts, and with the ability to detect auras of dangerous psychic criminals, Rachel Blake and her dust bunny companion have found peace and quiet on Rainshadow Island, operating a bookstore and café. But her tranquil new life is thrown into chaos when Harry Sebastian, the descendant of a notorious pirate, arrives to investigate strange developments in the privately owned woods know as the Preserve. Immediately drawn to the amber-eyes woman, Harry must tread carefully. While Rachel's special talents can help him track down dangerous rogues who have violated the Preserve, they can also sense the heart of darkness within him. But desire can weaken the toughest of defenses—and leave even the strongest man wanting more. So the truth is, while this was an enjoyable book, the only thought that really came to mind after I finished it was that the dust bunnies didn't get nearly enough book time as I would have liked. I suppose without dialogue, a dust bunny can only be described in so many ways, and typically they come off as the carefree, almost childlike, primitive creatures who "live in the moment." I'm not saying that Darwina wasn't great--she was adorable as far as dust bunnies go--but she also didn't really stand out when compared with some of the previous dust bunnies featured in the Harmony series. And even her obsession with carrying around the Amberella doll didn't make her stand out either. In fact, the previous book's dust bunny, Rex, still stood out more with his own attachment to a sparkly clutch purse. But this book wasn't all about dust bunnies. I know this. This book was another entertaining, exciting installment of the Harmony series, taking place on a newly introduced island in the Harmony world called Rainshadow. Truth be told, while the rest of the series had seemed quite sci-fi, what with talks of alien technology and the catacombs, for some reason, placing the setting on an island seemed to bring the series back down to earth. Basically, what I'm saying is, the book felt more like it was taking place in present-day earth rather than a futuristic non-earth planet. It might have taken a little bit of effort for me to remember where these people were and what time period this book was taking place. It probably doesn't help that these past few installments' publication dates are closer to our current year (in real life). So the colloquialisms and dialogue feels less dated and more present-day. Nonetheless, The Lost Night was still the typical, enjoyable Jayne Castle paranormal/sci-fi story with lovely, good characters, and an intriguing mystery. 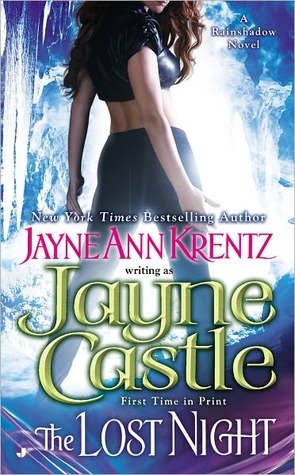 Just like every other Jayne Castle Harmony installment. It's like a cozy, familiar place to come back to every few days or weeks, because, despite knowing that it's the same formula as the last book, it's still kind of nice to know I'll enjoy it even before getting into it. For this book in particular, Harry and Rachel were great characters. The one complaint I have about them is that neither of their paranormal abilities were particularly clear--I wasn't entirely sure what they were able to do. Rachel's was a bit more clear than Harry's, but still a bit confusing. The mystery seemed less than interesting, to be honest, and I don't know if this has to do with my own lack of attention. Nonetheless, a great book for a rainy day... if I had finished it in one day. Instead, I think I dragged the reading out for longer than I had expected.